What’s for dinner tonight you wonder….? Swiss zoo, Langenberg Wildlife Park has been tending to some rather savory delights lately as the zoo has taken to serving wildlife on its grounds on its menu. The move comes as zoo authorities tell that they are quickly running out of room to keep all the animals and although animal welfare is their priority the enclosure argues it also needs to also control its numbers. Reports the UK’s dailymail: Just metres from where the animals once frolicked in fields and forest land, visitors can enjoy dishes such as braised wild boar, venison in cognac sauce, boar sausages and wild deer carpaccio. Hmm, venison in cognac sauce doesn’t sound so bad to me. Never mind the fact that one can probably admire the animal’s offspring as one nonchalantly gazes out the restaurant window as it too nibbles on specks of grass and leaf. The sanctuary which is near Zurich and charges attendees nothing to visit is said to house 16 native animals including bears, elk, lynx, wolves, European bison and an endangered equine species called Przewalski’s horse. According to the park’s site it draws close to half a million visitors a year. The park admits killing and serving 49 deer and 10 wild boar since 2012, despite having resettlement projects for other animals. The starter menu offers guests wild deer carpaccio with warm mushroom salad, Arugula, shaved cheese and herb vinaigrette for £17.30 ( $29 USD). The main dishes include a Braised Roast wild boar with mashed potatoes and seasonal vegetables for £18.30 and the Venison in cognac sauce with Calvados apples and Frühlingsspätzli is priced at £25.80. Nevertheless the wildlife park’s restaurant has spurred an online petition which has resulted in over 100,000 signatures calling for the zoo to end the killing of healthy animals. Visitor reviews on Tripadvisor have condemned the park for eating its animals. Wrote one user: ‘Loved the animals but didn’t want to eat them thanks. Martyn Griffiths from European animal welfare group Eurogroup for Animals said: ‘It’s bizarre, the whole purpose of a wildlife park is to protect animals, not make them a food item. ‘We’re disappointed they are taking this approach. The menu does include a ‘Meat Declaration‘ which states that the meat comes exclusively from the park. And the Langenberg park’s restaurant gets a special mention on the Zurich tourist board’s website for its ‘delicious meat specialties’. Countered zoo spokesman Martin Kilchenmann who said animals were being offered as a result of space restrictions at the zoo: ‘It’s not our goal to sell the meat in the restaurant. If the animals have offspring then we have to manage the numbers. 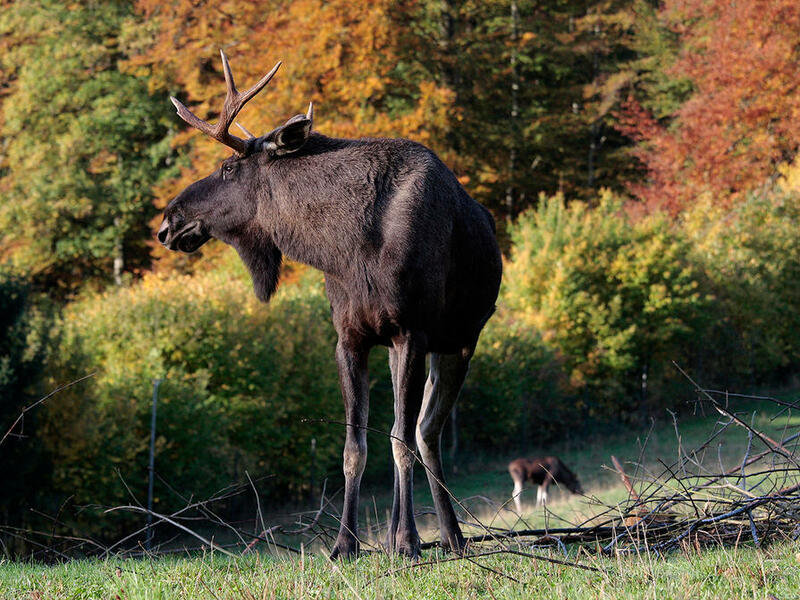 ‘It’s hard to sterilize deer and boars and the animals’ welfare is our most important goal. We don’t want to harm them. Of course one can’t help but wonder what kind of sauce the wild boar come with as well …? Shooting deer is not “the natural cycle”. It sounds like they have too many animals trapped in their zoo, and now they are in the business of having them multiply so they can make money off their deaths. This is so unethical. Zoos should not be about manufacturing meat. Zoos are completely inhumane. The fact that the animals they don’t want breeding breed too much (and the endangered species don’t breed well at all), shows that these institutions are not beneficial to the animals. It is commonplace, though heavily disliked by the public, for zoos to euthanize “excess” animals.